The 1933 Goudey Baseball Card Set is recognized as the first important gum release. America was deep in the depression in 1933 and kids did not have many pennies to spend. For a product to get that penny, there had to be value. In these tough times, the Goudey Gum Company of Boston launched its revolutionary “Big League Gum” product. The 1933 Goudey Baseball Cards includes 240 cards, and they were printed on thick cardboard stock, with bright colorful pictures, and they came with a nice big slab of gum. They were a great improvement over the smaller, thinner cardboard tobacco and candy cards that preceded them. It is important to remember that the 1933 Goudey baseball cards were the first color portraits of these stars that most people ever saw. The baseball card set represented a chance for kids to see their heroes up close and personal for the first time. Click here to find the 1933 Goudey Babe Ruth at Dean's Cards. The Goudey Gum Company tried hard to give the customers what they wanted. The greatest stars of the game had multiple cards. There are four different 1933 Goudey Babe Ruth cards, and the #144 Ruth was double printed. The 1933 Goudey baseball card set also has three cards of Joe Cronin and two cards each of Jimmy Foxx, Lou Gehrig, Rogers Hornsby, Carl Hubbell and Mel Ott. In 1933, while businesses were closing all across the United States and a quarter of the population was out of work because of the Great Depression, Goudey Gum more than quadrupled its sales over the previous year. The bubble gum baseball card was born. 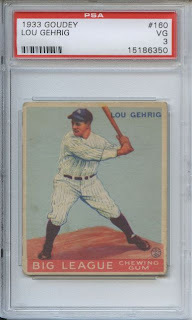 Click here to find the 1933 Lou Gehrig baseball card at Dean's Cards. Because of the financial success of the 1933 Goudey Gum baseball cards, three other U.S. bubble gum companies issued a baseball card set to keep pace with Goudey and to help sell their bubble gum. These included: a 32-card set by George C. Miller & Company, a 24-card set by the Delong Company ,and a 60-card set by the Orbit Gum Company. None of these sets were in the same league as the 1933 Goudey baseball card set, and none of the three ever issued another set of cards. A fifth competitor, the National Chicle Company produced a set of baseball cards the following year. Both National Chicle and Goudey would issue baseball cards sets from 1934 to 1937 – greatly reducing the sales from both companies. Goudey sold $460,000 worth of baseball cards in 1933, but sold half as many cards ($220,000) in the following year of 1934. The declining trend continued again into 1935, when Goudey sold a measly $116,000 worth of baseball cards. By this time, Goudey was selling five times as much bubble without baseball cards as with them. Since a slab of bubble gum cost a penny, with or without the cards, it was much more profitable for the gum companies to exclude the cards. You can read more about the 1933 Goudey baseball cards and the resulting bubble hum card war in my book: The Bubble Gum Card War. Dean's Cards has a great selection of 1933 Goudey baseball cards. And If you cannot afford the original Goudey cards, please check out the affordable 1933 Goudey Baseball Card Reprint set. Click here to sell your baseball cards. Labels: 1933 Goudey Babe Ruth, 1933 Goudey baseball cards, 1933 Goudey Lou Gehrig.